Characterizing the travel behavior of disadvantaged neighborhoods is of significance for social inequality elimination and public well-being promotion. However, rather few studies have empirically been conducted in respect of bicycling, especially in developing countries. Using the case of Shenzhen in China, this paper explores bicycling behavior associated with neighborhood social disadvantage (NSD). Data of 3 explained variables (bicycling frequency, travel duration and trip distance) for bicycling behavior is crawled from mobile application programming interface. Based on a set of 16 potential social indicators, we apply principal component analysis to construct NSD index and it produces 5 sub-indices including income, housing, occupation, education and population. Results of spatial regression demonstrate that NSD generally is positive with bicycling frequency and trip distance, while negative with travel duration. Specifically, income and population disadvantaged neighborhoods tend to bicycling for higher frequency, less time and longer distance. Housing disadvantage and education disadvantage reduce the likelihood of bicycling, while occupation disadvantage encourages bicycling frequency and trip distance. The variance decomposition shows that income disadvantage contributes most for bicycling frequency, housing disadvantage is more important for travel duration. For trip distance, education disadvantage is more influential. 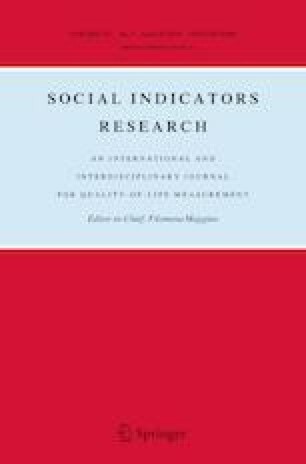 Our attempt provides an innovative insight into social indicators research. This paper is funded by the National 985 Project of Nontraditional Security at Huazhong University of Science and Technology, P.R. China. We also thank two anonymous reviewers for their valuable comments. Any remaining errors are the authors own responsibility.